Although experienced Pentesters may think it's yet another Tool-based teaching book, it's a must-read book for users of BackTrack. All in all, the written style is clear and concise. The authors have several years of experience in Penetration Testing and thus they clearly enlighten readers as to the whole pentesting methodology in accordance with the BackTrack Tools layout from starting Recon phase to ending Report Deliverables phases. In some areas, they demonstrate the use of the updated version of tools that might have been outdated in BackTrack 4/its PwnSauce SVN. As it's based on BackTrack4, some tools will not be included in BackTrack 5 or later. So, you better have BackTrack4 by side in order to practise the tools you haven't mastered. Nmap scripts are tuned to check only the specific services they intend. For example, ssl scripts (ssl-cert.nse, ssl-enum-ciphers.nse, sslv2.nse) are designed to check only for ssl-related services. Here, if you didn't specify -V service/version detection option and your target service is not in default port, your intended scripts wouldn't run on that port. 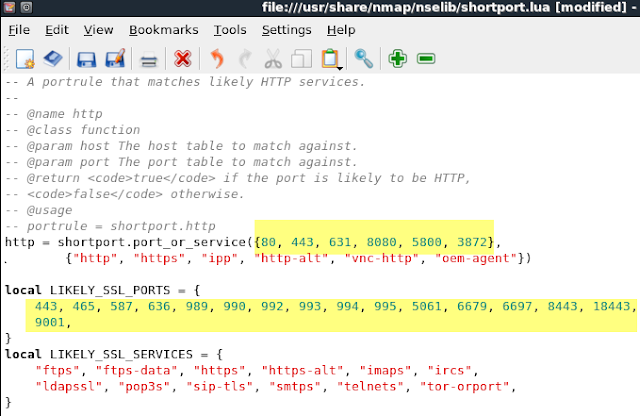 In times when you want to send less traffic and save time because you already know about your target info, you can fine-tune ./nselib/shortport.lua to add your own port rules.